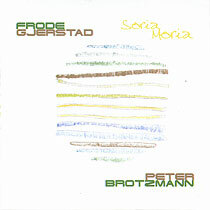 Frode Gjerstad, Eb, Bb and bass clarinets; Peter Brötzmann, tarogato, A-clarinet, bass clarinet. Recorded in Stavanger on 19 February 2003. Cover artwork (front cover reproduced above) by Camilla Søvik.